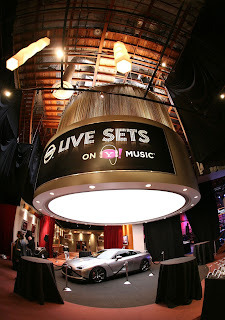 Home > Untagged One year of "Live sets"
Yahoo threw itself a one-year-old birthday party Tuesday night in the Fox Studios' concert space where it has been shooting "Nissan Live Sets on Yahoo! Music." True to the sponsor in the title, guests milled around a parked Nissan GT-R, enjoying cocktails that came with ice cubes encased in plastic molds glowing Yahoo's signature purple. Matchbox 20 (pictured after the jump) were kind enough to stick around to perform a midnight-ish set, just hours after taping an upcoming edition of "Nissan."